Safety Check – More than Peace of Mind | Edward Aten - Let's push things forward. 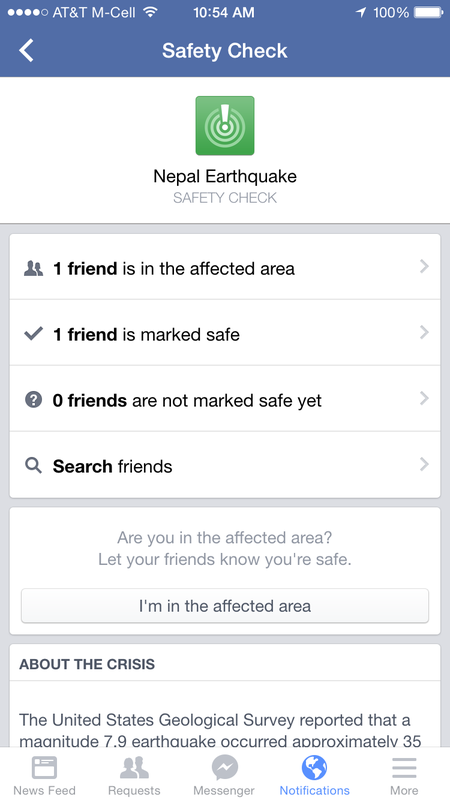 I woke up this AM wondering if I had somehow messed up my settings – Facebook was notifying me that one of my friends was reported safe from some game called Nepal Earthquake. It only took me another minute or two of checking my morning news to learn that it wasn’t a game, that a 7.9 earthquake had struck Nepal and not only was one of my friends there, but that she was safe. Like a vast majority of those utilizing this feature for the first time today, I was on the receiving side of the information and I was very glad to know the was safe. But it wasn’t that long ago I was on the other side. In April 2013 I was in Boston during the marathon bombings and instead of being reassured that someone I loved was safe, I was the one doing the reassuring. Within just minutes of the bombs going off my phone was filled with texts, tweets, Facebook messages and calls of people that cared about me wanting to make sure I was safe. While I felt loved, at the time I was much more focused on the immediate crisis: what was going on? Where should I go? Where were my family and friends I was meeting up with near where I had just heard explosions? Thousands of people were going through the exact same situation and within minutes the cell networks were either overloaded or being controlled by law enforcement to ensure no one was using them to trigger bombs remotely (note: I never went back to find out if that was true, but during a crisis person to person information, speculation and any thread of information turns into a game of telephone). When I did get messages or connection, it seemed like it was only friends from around the country asking if I was ok, but I couldn’t get through to my parents (who I was supposed to meet at the finish line) or my friends in Boston (who had been finishing their race around the time the bombs went off). To be clear, I don’t blame anyone at all for reaching out. I am very happy to be loved and appreciate how scary it must have been for the people that loved me to know I was somewhere and could have been hurt. But in an emergency your phone is a critical lifeline and its connection is supremely precious. While I know now that I was in a safe place, I didn’t know that at the time. I was working to deal with that was happening at that moment and those plans, information and communication with friends and family there had to be top priority. But our phones can’t tell the difference between essential communications and nonessential – so it was frustrating and scary to receive nonessential communications when I had essential things I couldn’t do because my phone was overloaded. That’s why I’m very happy Facebook has created this feature: It allows those in crisis situations to notify others they are safe and the people that care about them to know if they are ok without individual messages. The reach and ubiquity of Facebook can not only provide peace of mind on a large scale but it can free up the phones and networks of those in crisis situations to use them for their immediate critical needs.